I’ve been working in travel since I left school at 17. 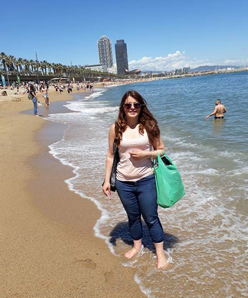 First, I joined Thomson as an apprentice and worked my way up –then I had a break to have a family and came back to working in travel when I joined Premier Travel Ely in 2014. It’s something that I’ve always been passionate about, I love getting to talk about travel all day and I love helping the customers find their dream holidays. Canada – the Rockies, Edmonton, Vancouver & Calgary; Italy, Tenerife, Paris, Disneyland Paris, Egypt, Ibiza, Turkey & Disneyworld Florida. South Africa to do a wildlife safari. I love animals and to see them in the wild where they should be is something I’d love to do. I’d love to do. Santorini in Greece – it looks so traditional and pretty. Thailand – my friend has recommended it and has even convinced my parents to book a holiday there! Australia – the photos look amazing and it would be something different to anything I’ve experienced so far. Canada – the pictures just don’t do it justice, I went during the autumn when the leaves were changing in the Rockies, which was breath taking. The people were really lovely too. Visiting the ice-filled glacier in the Canadian Rockies – it was something totally different and an all-round amazing experience. I’m passionate, enthusiastic about getting each person the right holiday, I love a bargain and will spend time sourcing the best deals. A comfy pair of shoes for walking excursions – plus you never know when the weather may change!